My story begins rather sad. 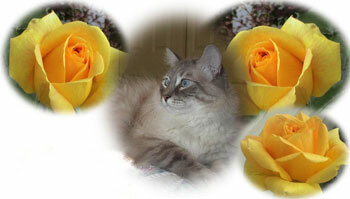 Last July I had to put to rest my beloved Siamese, Shu Shu who filled my life with endless love and happiness for 24 years. My heart was broken and everyday I longed for her, cried for her and missed her. Now, every time I look at Mt Rainier, I smile and think of her because that's where her ashes are laid to rest. I have never not had a furry friend in my life, and I was longing for the companionship of a kitty. Time went on and I adopted 2 beautiful Siamese sisters from animal control. One week later, they both became ill and sadly had to be put to sleep. They came into the shelter from an abusive home unknown to anyone with the horrible disease, distemper, and could not be saved. When I brought them home as I was watching them romp and play like little 7 week old kittens do so well, I became so attached to them. They gave such happiness, joy and love in their short little lives. My heart was so sad again and I had decided I just couldn't take loosing any more kitties. I had been in contact with Jo from Feline Friends. She knew my story and gave me endless encouragement and hope. She kept telling me that it was going to be ok and that someday she would find me some "forever friends". I wasn't sure about the whole thing and was so afraid of loosing more. Jo worked so hard with me making sure my home was safe to bring more kitties there because the distemper virus is so strong and can survive for long periods of time in a home. As much as I love kitties and wanted so badly to rescue more. I still wasn't sure. 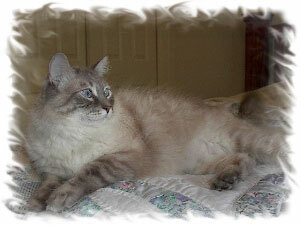 Knowing I have a passion for Siamese and ragdolls, Jo contacted me one day and told me of a rescue she was doing. So I decided to meet her at Steamboat Clinic. When I got there I saw these precious, scared, little flame-point kittens. Still unsure, I just knew I had to try again and bring more kitties into my home. Jo contacted me about a week later to tell me of this wonderful Siamese-ragdoll named Winter that she had rescued and was in her loving care. She knew exactly that he would be the perfect kitty for me. When I walked in and first saw Winter, he instantly stole my heart. That was it. I was hooked and I knew right then I was ready and that he would become my forever friend and I would be the one to give him a permanent happy, safe,and loving home. The day came, I was so happy and excited. I went to bring Winter home. When I arrived at the clinic, Jo had the little flame point brothers were there for pictures. Seeing them once again, I became hooked, now 3 times over! I decided to adopt all three of them. What can I say about Winter? 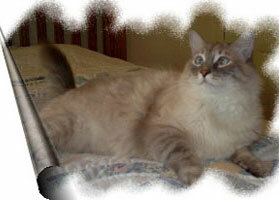 He is a lynx point ragdoll, weighing almost 20 pounds. He is a gentle giant. When I brought him home, he looked around, looked at me with those big blue eyes, almost like he was saying "thank you my friend". I think he knew this was going to be his forever home. He settled right in. Winter is one of the most personable kitties I have ever had. He is so friendly, he greets everyone who comes for a visit. He instantly "adopted" his 8 week old little brothers, Bailey and Bleu. Winter became their "daddy" watching over them so closely, gently playing with them not to hurt them, giving them their daily "baths", talking to them in "kitty-talk" and letting them sleep on him like a big furry pillow. Wherever the little boys are, he is. Always close by just like a "momma-daddy" kitty should be. Winter is just wonderful, the best kitty anyone could ever ask for. Jo was right, she knew. And besides, Winter also stole her heart and Lavada's heart. Seven happy, healthy months for them have gone by. The little boys are much bigger now and much more playful with Winter. Even when they chew on his ears, or chase him down he still is so watchful over them, still their big gentle daddy. The three of them were meant to be together, and were meant to be with my husband and me. They have brought us happiness, laughter and give us unconditional, endless joy and love every day. They have a safe, happy, warm home and it's all because of Jo. Everyday I think of the lives my boys might have unfortunately had if Jo hadn't rescued them and given them a second chance in their lives. I thank Jo and Feline Friends so much for all they do, for our furry friends, and all the encouragement, caring and understanding she had with me through the bad time I had. I am forever grateful and thankful for her for bringing them into my life and for all the other kitties she saves who come under her loving care, so they can have a forever home too.